No sooner do you walk out of the Commandant's office than you notice that the rings you were wearing have vanished. You don't even feel a tingle, just look to see they are gone. That brings a surprising sense of reality to this journey. No longer are you simple initiates. You are now on a real mission for the Shadow Tower. The walk to the Sceptre Tower takes a few hours, but is fairly easy. You pass the spot where you and the Green Team battled. Unsurprisingly, though it has only been a day, there is no evidence anything ever happened there. There are no blood stains where combatants fell, not even footprints on the dirt road. You pass through Ravengro, heading south. The southern road looks very similar to that between the Shadow Tower and the town. It is hard-packed dirt lined with simple forests and meadows. There is no sign of life other than some bird song. Finally, you reach the Sceptre Tower. The Tower is covered in runes, and stretches more than 70 feet above your heads. Stairs lead from the ground to an entrance a couple of stories up. It is surrounded by ruined walls, suggesting that this is the remaining keep of what was once a very strong fortress. So overtaken are you by the sight that it actually takes a couple of moments to notice the bodies of guards wearing the livery of the Shadow Tower lying near the bottom of the staircase. Stopping to listen, you hear no sounds of battle, and a closer examination of the bodies indicates they have been dead for some hours now. Cautiously, you proceed up the stairway, finding the large wooden double doors unlocked and wide open. Four watchmen wearing tunics with a white rose on them are in the large antechamber. Two sit playing at dice with a stack of gold coins on the table between them. Two more lean against a wall, but are paying enough attention to warn the others. All draw short swords, wondering what the interruption is about. You see hand crossbows hanging by their sides, as well. The room is fairly bare outside of the table and a small fire burning in a fire pit next to it. Another set of doors leads out the back, but those are closed. Fire: The fire deals 1d6+1 fire damage to anyone who enters or starts a turn in its square. OOC: Tchort and Koliak didn't fit on the map, but are at what would be H16 and I16 respectively. I will move them up onto the map as others vacate the doorway. "Try to form a phalanx at the door. Create a choke point and let them come to us." says Koliak to Corvan in hushed tones. "I don't think so Kol. They've got hand crossbows and won't need to come to us. We need to hit them fast and hard." Not seeing anything that concerns him, Corvan puts action to his words and rushes two of the guards, sliding his shield behind him on the way. His blade hums and his fist pounds before he readies his shield again, awaiting the retaliation. OOC: Given the combination of Master of Arms feat and Battle Harness property, I'm doing the equipping/unequipping as free actions per previous discussions. Flub on yellow. Assuming I hit blue, sliding it into the fire at H8, and Corvan gets +1 AC/REF from his ki focus (reflected in "current defenses" below. Marking both. Arena Training: Proficiency with Greatspear and Singing Stick. You gain a +2 proficiency bonus to attack rolls with improvised weapons. Your attacks with one-handed improvised weapons deal 1d8 damage, and your attacks with two-handed improvised weapons deal 1d10 damage. Master of the Fist (Monk Multiclass): You gain training in Athletics or Acrobatics (chosen). You also gain the monk’s Unarmed Combatant feature (+3/1d and gain proficiency with ki focuses. Deadly Draw: Whenever you pull or slide an enemy to a square adjacent to you, you gain combat advantage against that enemy until the end of your next turn. The following attacks respectively already include +1 24h, +1 charge. Hide Battle Harness +1 As a free action, you can draw a sheathed weapon or retrieve a stowed item. You gain a power bonus to initiative equal to the item’s enhancement bonus. Combat Agility Opportunity Action, Trigger: An enemy adjacent to you takes an action that provokes an opportunity attack. Effect: After the triggering enemy completes the action, you shift a number of squares equal to your Dexterity modifier. You must end the shift closer to the target than you were when you began the shift. Then make the following attack. Target: The triggering enemy. Attack: Strength vs. AC. Hit: 1[W] + Strength modifier damage, and you knock the target prone. Combat Challenge hit or miss an enemy you can mark it, Immediate Interrupt Melee, Effect: Whenever an enemy marked by you is adjacent to you and shifts or makes an attack that does not include you as a target, you can make a melee basic attack against that enemy. Footwork Lure Melee weapon, Target: One creature, Attack: Strength vs. AC, Hit: 1[W] + Strength modifier damage. You can shift 1 square and slide the target 1 square into the space you left. Grappling Strike Melee touch, Requirement: You must have a hand free. Target: One creature, Attack: Strength vs. AC, Hit: 1[W] + Strength modifier damage, and you grab the target. The grab ends automatically at the end of your next turn. Weapon Master's Strike Melee weapon, Target: One creature, Effect: Before making this attack, you may sheathe a weapon and draw a different one as a free action. Attack: Strength vs. AC, Hit: 1[W] + Strength modifier damage. In addition, the target takes an additional effect based on the weapon you wield. Axe: The target takes extra damage equal to your Constitution modifier. Mace: You slide the target 1 square. Heavy Blade: Until the end of your next turn, you gain a +1 power bonus to AC against the target’s attacks. Spear or Polearm: Until the end of your next turn, the target provokes opportunity attacks from you when it shifts. Disrupting Advance melee weapon, Target: One creature, Attack: Primary ability vs. AC Hit: 2[W] + ability modifier damage, and you push the target 2 squares. The target and each enemy adjacent to the target at the end of the push are slowed until the end of your next turn. Level 11: 3[W] + ability modifier damage. Level 21: 4[W] + ability modifier damage. Forceful Drag move, Requirement: You must have a creature grabbed. Effect: You move your speed. For each square you move, you slide a creature grabbed by you 1 square to a square adjacent to you. The creature remains grabbed, and you do not provoke an opportunity attack from the grabbed creature for this movement. At the end of the move, you can end the grab to knock the creature prone. Funneling Flurry Melee weapon, Requirement: You must be wielding two melee weapons. Targets: Two creatures, Attack: Strength vs. AC (main weapon and off-hand weapon), one attack per target, Hit: 1[W] + Strength modifier damage, and you slide the target 1 square. Shove and Slap Melee 1, Requirement: You must be using a shield. 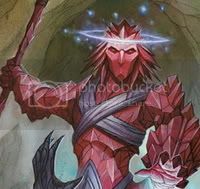 Primary Target: One creature, Primary Attack: Strength + 3 vs. Fortitude, Hit: 2d10 + Strength modifier damage, and you push the primary target a number of squares equal to 1 + your Wisdom modifier. You can shift 1 square into the space your target occupied. Miss: Half damage, and you push the primary target 1 square. Effect: Make a secondary attack. Secondary Target: One creature other than the primary target, Secondary Attack: Strength + 3 vs. Fortitude, Hit: Strength modifier damage, and the secondary target is dazed (save ends). Corvan's attack misses one foe, but pushes the other into the fire. (1d6+1=4, 1d6+1=3 4 fire damage for entering, 3 for starting turn) As the watchman screams in pain, another yells toward the back doors. "Help! We are being attacked!" The watchman Corvan missed shifts to one side and readies an attack for his companion, who moves from the fire to take position on Corvan's other side. Fortunately for Corvan, both swords miss wide. He does find himself unable to take his attention off one of them, though (marked by Yellow). The two watchmen by the wall draw their hand crossbows in their free hands. Two bolts scream toward Corvan and unlike the sword blades, both find their marks. (17 total damage). They then move over toward the melee. Corvan tries to punish the one guard for tactical movement, but swings wide, his weapon humming. Hammer yell. Smash man. Yell again. Men flee. OOC: HowlStr Charge to G10, hitting Blue AC 30 for 10 dam, -2 AC for me USNT. Iron Wolf Charge, doing 5 more dam to Blue (15 total) and hit Yellow Will 16, Blue Will 25, Green Will 25, and Red Will 8. On hits, push each 2 sq (Yellow to C7, Blue to H8, Green to I8, Red to K10) and they take -2 to attack rolls UENT. Hammer's charge is mighty, but his yell is even more fearsome. The already slightly crispy enemy, now bleeding, falls back into the fire 1d6+1=2. Two others also are scared by the metal man screaming and stumble backwards (only red was missed). The back doors open. Two more heavily armed and armored soldiers come through, also with white roses on their breasts. One (orange) can only approach the melee, but the other pulls a crossbow and fires at Hammer, penetrating his arm for 8 damage. Dwimmerlaik moves into the room, then charges towards the wounded guard, stabbing him with his cold blade. Somehow, Dwimmerlaik doubts that the cold will help with the flames, or vice versa. Move action - Move to E11. Standard action - Charge with Icy Skewer against Blue, ending in G9. Using my Practiced Killer damage if I hit. Hits AC 21 for 13 cold damage, and on a hit, gain a +2 power bonus to all defenses against the target's attacks until the end of my next turn. If that kills Blue, I'll teleport to J11 with Soul Step. Past Life - Human (Race): Human feats, paragon paths, and epic destinies are available if all other prerequisites are met. Undead (Race): You are considered to be both a living creature and an undead creature for effects that relate to that keyword. Unnatural Vitality (Race): At 0 HP or below, can choose to remain conscious and dazed until failing a death saving throw. Son of Alagondar Starting Feature (Theme): While you flank an enemy, your allies gain a +1 power bonus to attack rolls against that enemy. In addition, you gain the Low Blow power. Rod Expertise (Feat): +1 to hit with rods, +1 shield bonus to AC and Reflex. -Eldritch Bolt - RBA, +7 vs Reflex, 1d10+8 force damage, range 10, one creature. -Icy Skewer - MBA, +10 vs AC, 1d10+8 cold damage and gain a +2 power bonus to all defenses against the target's attacks until the end of my next turn, range melee, one creature. Ice doesn't help standing in a fire when it comes in the form of a blade through the heart. The watchman drops quickly, and Dwimmerlaik teleports away. OOC: Full update later. Blue is dead. Dwim is at J11. Tchort is up. "Tchort! Pull that hesitant soldier closer and let Dwim have at him. Then Kol can mess with four of them at once." OOC: Suggesting Tchort use blunder on purple to slide it to J10, where Dwim can MBA. Kol could then burst 1 four of them. OOC: Sorry about the delay. Been sick. Tchort takes a moment to contemplate things, but by then the battle had been started in ernest. Why would someone leave the dead guards at the bottom of the stairs for almost anyone to find? Why not don their cloaks and try catching someone like us unawares? Who uses that insignia? With a snarl towards Corvan, Tchort glides through the room. Seeing the furthest soldier shifting his weight nerviously, Tchort reaches forth his mind and attempts to cause him to slip into Dwimmerlaik's reach. Suddenly, the soldier lurches forward, giving Dwimmerlaik a chance to connect with his icy blade. Sensing a chance to turn the tide of the battle quickly, Tchort swirls his hands, and draws upon one of the many powers he learned in training, summoning brimstone and fire in the midst of his enemies. Looking upon his handywork, he smiles at Corvan, almost taunting him into a second wind. "Good plan. Perhaps you can help clean up?" Attack hits CRIT! against green for 14 damage and reflex 12 orange, 17 purple, and 12 red for 9 fire damage. Zone created that lasts UENT, anyone staying within or entering zone takes 5 fire damage. Minor: Majestic Word upon Corvan, healing surge +4 HP. "Ha! Yes, I can clean up the burned corpses after you, but it would be smarter if we kept one alive for questioning." OOC: Nice one-two combo. Thanks for the healing. Tchort looks carefully at the white rose sigil. While he cannot come up with any religious significance to it, he remembers that in his arcane history courses with the Head Wizard, the white rose was used as the insignia for a branch of zealots within the Barony of Lepidstadt, located to the south. These zealots wished to rid the world of all evil, but took a very broad approach, typically meaning anyone not human or worshipping a deity of good. However, it was believed that the movement died out with the end of the war with Carlstadt. He can also tell that these are just low-level soldiers, probably unaware of anything more than being tasked to guard the entry to the Tower. Koliak can only grin at seeing how the soldiers have ended up all bunched together. Good work by the crew. 'I may not even have to move.' says Koliak to himself with a chuckle. Concentrating on the bunched up group of soldiers, Koliak holds his orb outwards, and with his off-hand he pushes his hand forward, palm out, fingers extended. The area explodes with psychic energy! All four of the soldiers are affected. One of the soldiers finds himself in the fire, having been lifted into by Koliak's manipulations. The soldier can't do anything but burn some more. Some of the others, find themselves moved as well. The whole area is scrambled with psychic energy. Koliak then gestures with an open finger and another of the soldiers finds himself sliding into the fire, then aghast, back into the magical argent rain. Poor soldier finds himself just the puppet. A fiery one. *I think I may have confused the colors; yellow & orange. If orange is in the bunch of soldiers, he is the one getting hit. OOC: Nice use of the zone. I figure I should lay out my vague plan in dropping the zone. If one or more melee characters can close on the zone and threaten the enemies inside it, they will have the choice of shifting out of the zone between us, staying put for 5 damage, or suffering an OA to move out the back of the zone. If they shift forward, I should be able to push one back into the fire on my turn. OOC-I put them outside the zone in hopes they can be pushed back in, thus getting more out of the zone than them just standing in it. Hope it works. OOC: That works too. I hadn't even considered it. They now have their backs to a wall so to speak. Argent Rain Zone - Any creature entering or ending turn inside takes 5 fire damage. Lasts ENT Tchort. Jak notices that one guard isn't paying as much attention to the whole battle as he should. Jak rushes him and gives him a powerful shove, directly into the sinister fire Tchort conjured. Jak raises his voice to the heavens and calls upon the Divine Strength of Dol Dorn to grant him power. With his deity's boon, Jak brandishes his holy symbol and blinding light stabs out at the arrayed enemies. Those enemies in the fires are completely preoccupied, and remain unaffected, but the other guard and soldier are not so fortunate. Dol Dorn's holy light sears into them and leaves them impaired and in pain. Jak calls out a challenge to the soldier standing in the fire, "Come to me human, we shall see if you are worthy of life!" Standard Action: Bull Rush vs Green 1d20+4(str)+1(24hrs) 24 vs FORT. He is pushed into j10 and I occupy i11. Argent Rain damage to Green 1d10+4 13 fire to Green. Damage 1d8+5(base)+4(Div Str) 17 Radiant damage and Purple and Red have a -2 to attacks UENT. Convert Move to Minor Action: Divine Challenge on Orange. Virtue (Minor; Personal; I spend a healing surge to gain THP equal to my surge value instead of HP. +1 Bloodclaw Falchion (+3 Prof, +1 Magic, 2d4+1 Damage, 1d6 Crit) Encounter Ability: Free action upon a hit; I take enhancement bonus damage. Increase the damage dealt to the target by double the amount of damge I took. Triple when I wield the weapon two-handed. Heavy Blade Expertise +1,2,3 to attack when using a Heavy Blade. Also gain +2 defenses vs opportunity attacks. Improved Initiative +4 to initiative rolls. Virtuous Recovery Gain Resist all damage equal to Wis Mod (3) till the start of my next turn whenever I spend a healing surge. OOC: I checked the compendium and it doesn't say anything about a move being included in the bull rush, but I've always assumed you needed momentum to accomplish it. If that is not the case, I'll forgo turning my move into a minor to challenge and move to h12 before the bull rush attempt. OOC: No move is needed for bull rush, but charging adds the plus one to attack. Corvan tries to jab the wounded watchman back into the fire, but can't shake the nervous feeling of leaving an enemy at his back. He moves to cover Hammer's back.